Home » Repression vs. Suppression – What’s the Difference? All languages have words that are similar to each other, and English is no exception. There are so many nouns in English that some of them are destined to cause confusion with others. Suppression and repression are two such nouns. They look identical, save the first syllable, but that first syllable is very important. The meanings of these words, too, are quite similar, with only subtle shades of meaning setting them apart. Most of the time, context will determine when to use which word. Strong writing relies on careful word choice, so by knowing the difference between suppression and repression, you can become a better writer. In this post, I will compare suppression vs. repression. I will use each word in at least one example sentence, so you can see it in its proper context. Plus, I will show you a helpful memory tool that will allow you to remember whether suppression or repression is the better word for a given context. What does repression mean? Repression is a noun. It refers to the act of repressing. To repress is to hold something back or to prevent an act of volition, especially by force. The root word in repression is repress, a verb, and it becomes repressive as an adjective. People, thoughts, ideas, and desires can all be repressed. The patient suffers from repression of natural desires that carries over from an unusually puritanical childhood. The repression of people groups is a societal ill that persists even into the 21st century. Repression is also useful in psychology, as well as other contexts, like sociology, and it was first recorded in English in the 15th century. What does suppression mean? Suppression is also a noun and is defined as the act of suppressing. To suppress something is to put an end to it forcibly, among other things. Suppress can also mean to curtail or prohibit the activities of and to keep from being revealed, published, or circulated. The root of suppression is the verb suppress. As an adjective, it becomes suppressive. Gunmen might lay down suppressive fire or a political party might engage in voter suppression to engineer a favorable electorate. I have included a couple more examples below. Suppression of bleeding is a key step in treating many severe wounds. The media achieved their extraordinary power through suppression of dissent. One of the defining qualities of suppression is that is suggests an active curtailment or fight against an opposing force (more on this below). Suppression is a useful noun in many contexts, including politics, psychology, and military tactics. The word itself has been in use in English since the 15th century. Suppression and repression have similar meanings, and they overlap in certain circumstances. That said, there are some differences worth paying attention to. Both refer, generally, to the act of holding something back or subduing something, although there are nuances to their meanings. Repress suggests keeping something under control to maintain or regulate order, while suppress suggests a more active curtailment, an active fight against an opposing force. Thus, The government repressed the rebellion implies that the government always maintained control and that the rebellious forces never posed a serious threat to governmental power before being put down, while The government suppressed the rebellion suggests that a significant rebellion was under way and that the government had to react strongly to put an end to it. Similarly, one might repress (rather than suppress) a smirk in order to maintain a serious appearance, and one would take a medicine that suppresses (rather than represses) a cough in order to reduce its severity. As you can see, there are slight differences between the two words, especially when applied to the individual. You repress a smile, but your medicine suppresses your cold. Suppression usually refers to stoppage or blockage (to force something to stop). Repression is more likely to mean inhibition (to hold something back). Suppression vs. Repression Check: Since suppress and stop both start with an S, so remembering the meaning of suppression should be easy. Is it suppression or repression? Suppression and repression are two similar nouns, and there meaning sometimes overlap. Suppression refers to stoppage or blockage, like in the context of bleeding or police tactics. Repression means inhibition, like in sociological or psychological contexts. The distinction may be small, but it is important. 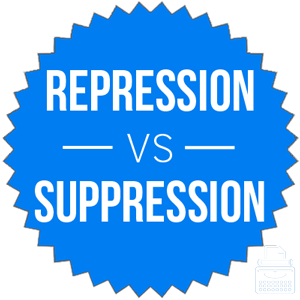 1 What is the Difference Between Repression and Suppression?